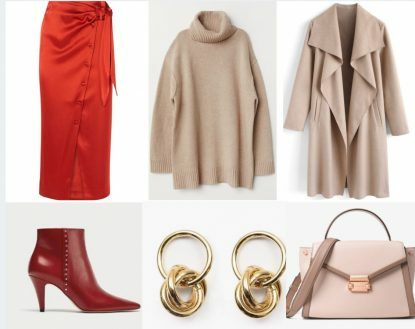 Wear a satin midi skirt with tuck-in sweater and pair it with ankle boots, accessorizing with trendy gold multi – hoops earrings. The red and beige color combo perfectly blend the classic red of the holiday season and the timeless elegance of the warm beige. 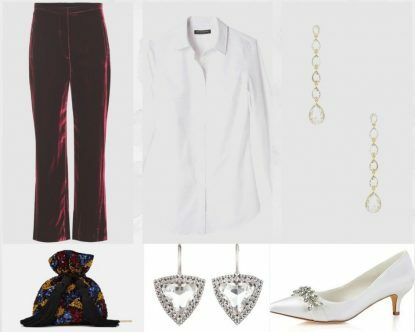 A pair of trousers and a button-down white shirt is a classic combo that can be your favorite this Holiday Season if you style it well. 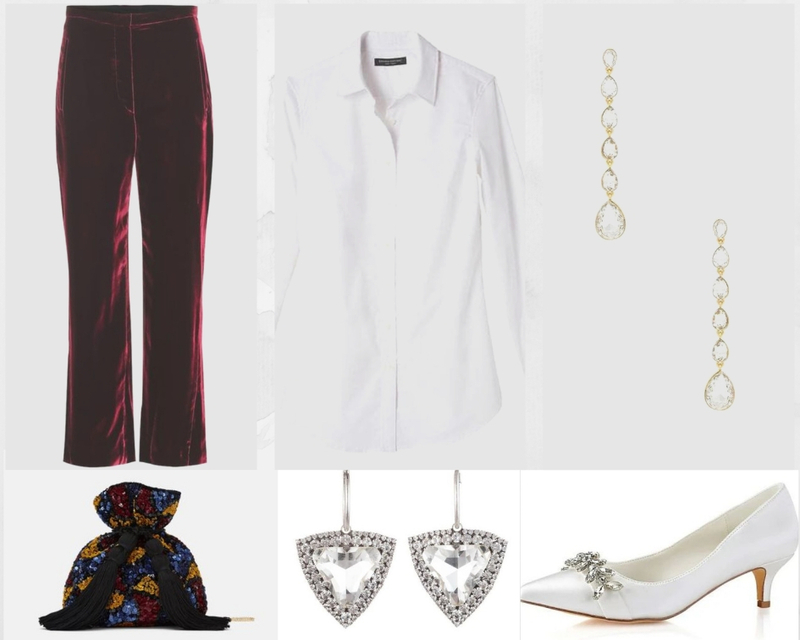 Choose velvet fabric for pants with a flattering high rise waist that will elongate your legs more when you tuck in the crisp white shirt. Accessorize with embellished heels and a mini party bag to add color and texture to the outfit. Make a fashion statement finishing the look with one of the holiday jewelry trends – a pair of drop rhinestone earrings. Or you can match your earrings to your shoes wearing classic heart-shaped rhinestone earrings. 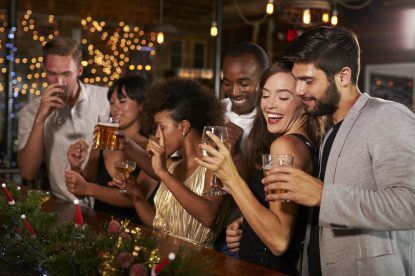 An outfit that can take you from the office to the cocktail party can be tricky especially if the event takes place straight after office hours. A versatile and efficient outfit that always works is the skirt-blouse combo. 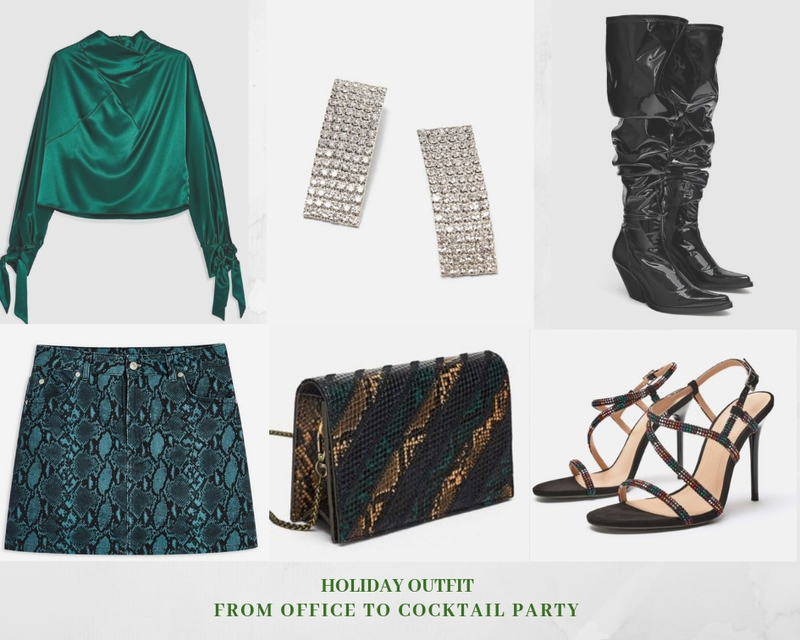 Pair it with boots for the office hours and swap the boots with high-heeled sandals for the cocktail party. Freshen up your makeup, make sure your lipstick is not on your teeth, fix your hairstyle and get ready for the party. I hope these outfits will be a great inspiration for you and will help you to pick something out, to feel comfortable, and to enjoy the holiday office party.